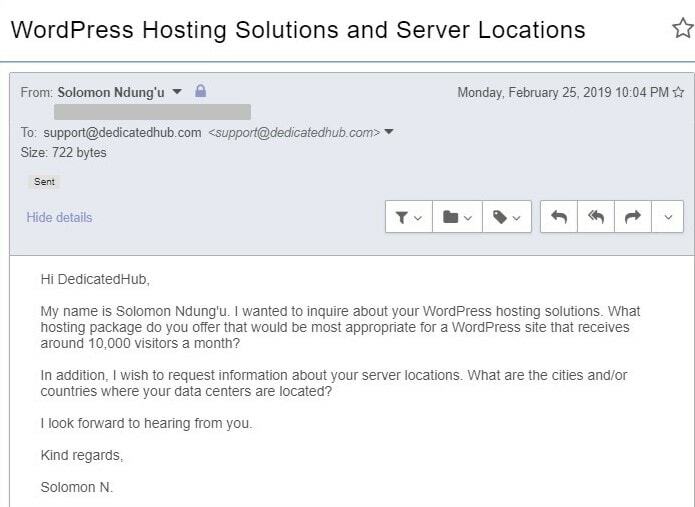 DedicatedHub Review 2019: Is DedicatedHub a Good Hosting? DedicatedHub is a web hosting provider offering VPS and dedicated server hosting services. The vendor is located in Delaware, United States. DedicatedHub is a U.S. based web hosting provider. The vendor specializes in providing dedicated servers, VPS, and cloud server hosting solutions. It prides itself on providing hosting solutions operated on SSD, SAS, and SATA cloud servers. DedicatedHub has a number of data centers located in Turkey, the Netherlands, Germany, Hong Kong, Italy, France, Singapore, Japan, and the U.S.
DedicatedHub hosting plans run on SSD, SAS, and SATA disks servers. The servers use modern Intel Xeon processors including Xeon quad core for high performance and reliability. The vendor’s dedicated servers start from DEDHUB-BMS1 (8GB RAM, 300GB SAS disk space, and 16 IP addresses) to DEDHUB-BMS5 (64GB RAM, 2TB SATA disk space, and 253 IP addresses). DedicatedHub servers are monitored 24/7/365 to ensure that the system keeps running round the clock and that emerging issues are addressed promptly and effectively. All the same, the vendor does not commit itself to an uptime network guarantee. This vendor does not offer backup services and none of its packages include SSL certificates, even as an additional solution. DedicatedHub hosting solutions are competitively priced. The vendor offers monthly, quarterly, semi-annual, and annual billing cycles. Its hosting prices are listed in U.S. dollars. Customers can pay via Paypal or using their credit cards. DedicatedHub has no money-back guarantee or any other refund policy. Unlike most hosting companies that offer cPanel for free, DedicatedHub charges its customers a fee to access it. DedicatedHub’s support team is available 24/7. You can get in touch with them via email, live chat, or ticketing system. The vendor has not availed a support phone number. Although the vendor claims that its average response time is less than 20 minutes, the support email I sent never got a response. Mind you, this is after I unsuccessfully tried reaching the vendor via their live chat. What’s more, the support link on its website returns a 404 error. The DedicatedHub website has neither a knowledge base nor an FAQ section. DedicatedHub hosting solutions are designed to meet the needs of medium-sized businesses and large enterprises in the U.S. and beyond. While it is quite clear that the vendor has the hosting infrastructure to deliver excellent hosting, its investment in its support team is questionable. For businesses that would require considerable input from the vendor’s support team, using this firm’s hosting solutions could present a challenge. That said, large enterprises with in-house tech and support team could find this hosting provider’s solutions adequate. Wondering how DedicatedHub stacks up against other Web Hosting companies? Enter any other Web Hosting company and we will give you a side-by-side comparison.